Al Pacino in 88 Minutes. FOLLOWING last week’s Righteous Kill, Al Pacino returns to cinema screens this week in 88 Minutes. This furiously paced thriller stars Pacino as an academic psychiatrist, Dr Jack Gramm, who is renowned both for his abilities and decadent lifestyle. One morning Gramm answers his phone and is informed he has only 88 minutes to live. The film follows him almost in real time as he frantically tries to discover who is behind the threat. A key suspect is serial killer Jon Forster (Neal McDonough ), who was convicted of murder following Gramm’s damning testimony against him. As Forster is behind bars, Gramm suspects a copycat killer and attempts to prove his theory to the FBI. Gramm is surrounded by a glamorous team of hardworking women. His PA Shelly (Amy Brenneman ) ably runs his life while his teaching assistant Kim (Alicia Witt ) delivers his lectures in his absence. Meanwhile a team of eager postgraduates happily assist him with case research. Each of these women is framed as a possible suspect throughout the film, which becomes confusing. We are introduced to a bewildering number of detailed storylines which are then left aside, leading to too many loose ends. Director Jon Avnet has packed in too many plotlines alongside a faintly daft overall premise. The result is a somewhat silly movie. However, performances across the board are generally good. Pacino is on fine form here, managing to make an obsessive workaholic character sympathetic without unnecessarily declaiming or otherwise over-acting. Brenneman and especially Witt are convincing despite the fact that both characters are mired in ridiculous subplots. Leelee Sobieski and former OC star Benjamin McKenzie are impressive as obsessive students. In an odd coincidence Avnet also directed Pacino in last week’s Righteous Kill alongside Robert De Niro. 88 Minutes began filming three years ago but has been given a delayed release. 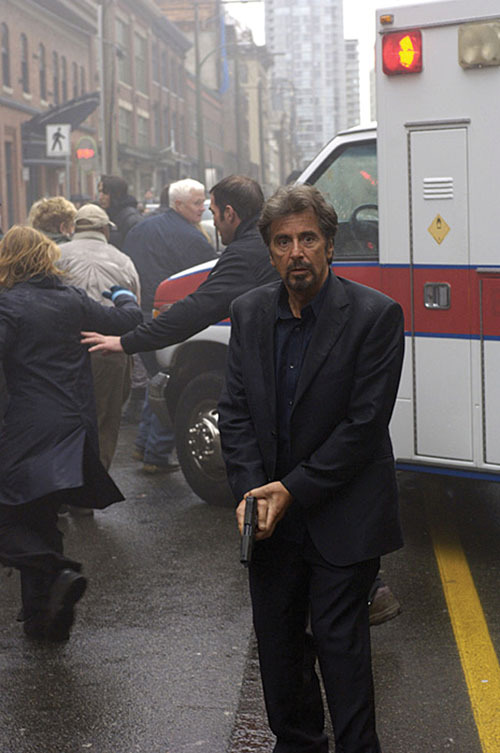 Ultimately less thoughtful and more frenetic than last week’s Pacino vehicle, 88 Minutes is a somewhat enjoyable if often preposterous whodunit. It would be good to see Pacino get his teeth into a great role again, if he can find one.